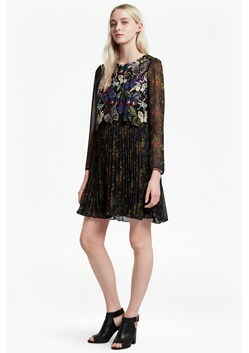 Multicoloured butterflies and florals adorn this long-sleeved fit-and-flare dress to suit all special-occasion events. It is made from fluid semi-sheer chiffon with a contrast embroidered double layer, pleated flippy skirt and lined body for all-night modesty, guaranteed. Our model is 5ft 10" and is wearing a UK size 10 in Utility Blue Multi.